Expelled: No Intelligence Allowed is a documentary film charging Darwinists with suppressing and persecuting scholars who disagree with them in order to avoid discussing the scientific challenges which intelligent design presents to the Origins of Species aspects of the theory of evolution. The film's premise, which it goes on to prove with unassailable logic, is that scientists have been met with harsh opposition and/or received punishments from schools, universities and the scientific community merely for daring to ask inconvenient questions. The documentary is co-written and hosted by Ben Stein and was released in America on Friday, April 18, 2008. 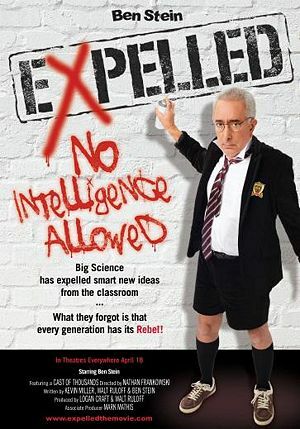 This movie follows Ben Stein as he seeks to prove that far from being a pseudo-science trying to undermine evolutionary biology, Intelligent Design is in fact a legitimate science being suppressed by a scientific establishment that is hostile to any deviation from the status quo. In the film's trailer, Stein states that there are "people out there who want to keep science in a little box where it can’t possibly touch God" and that "freedom of thought and freedom of inquiry have been expelled from publicly-funded high schools, universities and research institutions." This also refers to privately funded science institutions as well. Perhaps most infuriatingly true and telling for design opponents is the way the film links Darwin's ideas to Social Darwinism and destructive, immoral, atheistic ideologies such as Hitler's National Socialism and Marxist socialism. The film clearly shows that scientists and educators who promote intelligent design are persecuted by the scientific establishment. Examples given by the film include Richard Sternberg, a biologist, journal editor, and research associate at the National Museum of Natural History, and Guillermo Gonzalez, a pro-intelligent design astrophysicist denied tenure at Iowa State University in 2007. The film opens with documentary footage of the Berlin Wall going up and closes with it coming down. The day Darwinism and intelligent design can be fairly discussed without fear of reprisal represents the removal of a barrier even greater than the Berlin Wall. The film exposes the ulterior motives of intelligent design opponents who have taken the lead in suppressing mention of ID in classrooms and scientific journals, based on the theory's ideological implications. The implication being that if ID is true, naturalistic evolution as a causation for all life on the planet is false, which removes the ground on which one of the most successful arguments for atheism is built. The film documents why advocacy for atheism is the most prominent motive to suppress ID and raises awareness to those who do not understand or were deceived by the underlying philosophical culture war. The film describes how the current status quo of the educational system is a de facto endorsement of militant Marxist atheism as a state religion. As a result of this state sponsored perspective, those teachers, professors and academics who speak publicly to oppose atheistic dogma are denied access to funding, tenure and other benefits of participation in academia. The film does not argue to replace the state religion of atheism with any religion or belief in God. Rather, the film argues that all viewpoints should be included in discussion because of the intrinsic benefits of freedom. To describe the current situation, the film uses the metaphor of a wall erected between Darwinism and all other alternate explanations, similar to the Berlin Wall which the Communists erected to prevent communication and movement within the city. Rather than permit students to be exposed to weaknesses and flaws in evolutionary doctrine, the film claims the establishment suppresses alternate ideas and destroys the careers of academics and even journalists who openly question it. The film shows how opposition to ID is chiefly based on fervent support for atheism. ID theory says that a purely naturalistic explanation of the first appearance of life is not as likely as the idea that it was designed. This leads ideologically to questions about an intelligent designer with supernatural powers, just as surely as Darwinism's "survival of the fittest" leads to Social Darwinism and Eugenics. Those who are horrified at the Holocaust perpetrated by the Nazis condemn Darwinism for providing Hitler with ideological justification for his "Final Solution". The movie describes Darwinism as an interesting theory by 19th century standards, but hints at some of the many holes in Darwin's work. One example the films mentions is that modern science has uncovered some aspects of the staggering complexity of the cellular and subcellular mechanisms. The film claims that armed with even a limited knowledge of the inner workings at the cellular level, the idea that this life randomly designed itself completely defies credulity. This is a material fact of which Darwin was wholly unaware. The film's criticism, however, is not merely with Darwin, but also with the militant Marxist atheistic dogma that has become attached to Darwinism. The film points out that others have used Darwin's ideas as a panacea to neatly resolve the question of the origins of life. Through brief examples, the film illustrates why the Theory of Evolution as an explanation for the origins of life requires a leap of faith in atheism that is far more problematic than the leap required to believe the reverse. This sets up the main thrust of the film. Darwin's theory of Evolution by means of natural selection does not address the issue of the origins of life. Another point the film makes is that science is never served by a strict adherence to dogma. No question in science should be off the table. Therefore, a scientific mind must allow for the possibility that anything not falsifiable is possible. Contrary to this thought, forces in our culture today are fully invested in an atheistic concept of the universe and thus their interpretation of the theory of evolution and the Origin of Species is above reproach. These forces are fully entrenched in academia and it is policy at many institutions of learning to brook no dissent when it comes to the idea of intelligent design. The open mind begs the question: if we cannot establish with certainty whether the life was created or whether it appeared from sheer luck, then why are we forcing one of these two choices upon our academia? Just as Einstein's Theory of Relativity obliterated and at the same time upheld Isaac Newton's work in Physics, the film implies that there is perhaps a great deal to learn by asking questions about the origins of life. The film shows why Darwin's work is important and in many respects valid. That said, Darwin's works should not be used as philosophical works to describe the nature of God or the origins of life. Intelligent design is an attempt to fill in the gaps; it might be totally wrong. While makers of the documentary say the movie doesn't seek to champion intelligent design as the sole truth, they say it calls for more academic freedom, where challenges to any scientific theory including Darwinism would be fairly considered. For a more detailed treatment, see Eugenics. The film shows the historical connection between the ideology of "survival of the fittest" and the Holocaust. By the 1920s, German textbooks were teaching evolutionary concepts including heredity and racial hygiene. The Kaiser Wilhelm Institute of Anthropology, Human Heredity, and Eugenics was founded in 1927; in 1933, Germany passed the Law for the Protection of Heredity Health. Josef Mengele studied anthropology and paleontology and received his Ph.D. for his thesis entitled "Racial Morphological Research on the Lower Jaw Section of Four Racial Groups." In 1937, Mengele was recommended for and received a position as a research assistant with the Third Reich Institute for Hereditary, Biology and Racial Purity at the University of Frankfort, and subsequently became the "Angel of Death" for directing the operation of gas chambers of the Holocaust and for conducting horrific medical experiments on inmates in pursuit of eugenics. Evolutionist Stephen Jay Gould wrote: "The Nazi racial hygiene program began with involuntary sterilizations and ended with genocide." Steven C. Meyer said, "In Darwinism there's a denial of any intrinsic dignity for human persons. We are the result of undirected natural processes that did not have us in mind"
While the film takes pains to point out the theory of evolution is not solely responsible for the Holocaust, one Jewish group felt the tie-in between Darwin's theory and the Holocaust went too far. However, writers such as Hannah Arendt have uncontroversially (among researchers on this topic) pointed out the linkage between Darwinism and Hitler's Eugenics-based program of mass murder. "If you acknowledge this idea that design can be detected scientifically in the universe, then you open up the door to saying, 'Maybe this atheistic view isn't true,' [and] the entire worldview of people who are atheists crashes down around them," Mathis said. "This is a foundational concept for people who believe this way. So they defend it with incredible vigor." Expelled touches on Darwinism’s historical social costs, notably the unintended contribution to Nazi racial theories. That part packs an emotional wallop. It also happens to be based on impeccable scholarship. "The key elements in the ideology that produced Auschwitz are moral relativism aligned with a rejection of the sacredness of human life, a belief that violent competition in nature creates greater and lesser races, that the greater will inevitably exterminate the lesser, and finally that the lesser race most in need of extermination is the Jews. All but the last of these ideas may be found in Darwin’s writing." The film, a documentary, is about scientists and researchers who acknowledge the scientific evidence for the intelligent design of life and who have been ostracized or denied tenure as a result. In a word, they have been "expelled" from the academy. This powerful documentary is all about the persecution and censorship of any scientist who dares to oppose the Darwinist paradigm, by even suggesting the relatively modest hypothesis that the universe shows detectable evidence of design. Richard Dawkins "posits a creation theory of his own that fits the parameters of the film's working definition of intelligent design" in Expelled, but claims the movie is "dull, artless, amateurish, too long, poorly constructed, and utterly devoid of any style, wit, or subtlety." The movie does not criticize Darwinists for saying the cell "arose whole" but for arguing "that life arose from a primordial sea on a lifeless planet through a chance collision of chemicals". This is the typical pro-evolution device of pretending that critics don't understand what evolution is saying. But it backfires, because the movie comes with a leader's guide which shows that Kluger is the one in error. ...it kicked me in the gut. It made me see—no, feel—that I’d grown accustomed to the intolerable. I’d been taking the censorship as something in the natural order of things, and as the suppression increased, I just adjusted to it, like the proverbial frog in hot water. But the movie made me realize that our God-ordained right of free thought and speech is under systematic and increasing attack. By controlling the public “microphone”, as Phil Johnson says, the Darwinists have been hoodwinking our minds. Expelled opened on April 18, 2008, on 1000 screens in America. It grossed $2.97 million US, $2,824 per screen, in its first weekend and after three weeks had grossed $6.9 million US. It continued to make over $1,000 per screen in its third weekend The producers claim that it was pulled from American theaters due to a lawsuit by Yoko Ono. After the movie won a victory in the lawsuit, a second run release was announced Initially, Expelled grossed a domestic $7.7 million on a $3.5 million production budget. The promotional budget is unknown. After winning the lawsuit filed by Yoko Ono, Expelled also began opening in international theaters. The film was planned to be released on DVD in October 2008. Because of the apparent blackballing of the film by people who had never seen it, it is difficult to tell what actual viewers of the film thought. Removing the almost obligatory '1' ratings under the above assumption 1600 voters on the IMDB website gave it a 8.5 rating on a scale from 1 to 10. Visitors to the Box Office Mojo website gave it a "B-" rating, but this was an average of 266 "A" ratings, 17 "B" ratings, three "C" and "D" ratings each, and 135 "F" ratings, strongly supporting the idea that people's views of the topic affected their view of the film. Before the film opened, pro-evolution opponents of the film were heavily critical of its premise. The pro-evolution magazine Scientific American criticized the film, calling it "intellectually dishonest," and detailed their hatred of the film and intelligent design in a series of inflammatory articles. NCSE used the film's release to launch a fresh attack on ID, repeatedly calling it "creationism" as part of their strategy to demonize scientific critiques of evolution. The gist of their defense of Caroline Crocker's dismissal was (1) she wasn't "fired" (because that means only immediate termination in their book) but merely let go at the end of the semester as is common practice when a teacher is no longer needed on the faculty; and (2) each mention of intelligent design in class was an unauthorized addition to the curriculum. Apparently, only pro-evolution information is allowed in evolution class, and its weaknesses are not to be revealed if you want to get tenure. John Derbyshire, a columnist at the conservative National Review Online, wrote a surprisingly critical review, despite not having seen the film, and confused intelligent design with creationism. He said that "creationists" have been "morally corrupted" and engage in "willful act[s] of deception." He concludes that attacking "science" (i.e. evolution) is equivalent to attacking Western Civilization. As expected for a movie that is not 'politically correct', critics paid to rate movies have been harsh with only 3 positive reviews out of 33 on the website Rotten Tomatoes, and a 20 out of 100 rating on the website Metacritic. These reviews reflect the liberal bias dominant in the liberal media. Allegations have been made that the producers of the film used copyrighted material without permission at multiple points in the film. Yoko Ono, owner of the rights to John Lennon's songs including the one sampled in the film, "Imagine", has sued Premise Media for copyright violation. The Executive Producer and Chairman of Premise Media Logan Craft replied, "The fair use doctrine is a well established principle that gives the public the right to freely use portions of copyrighted materials for the purposes of commentary and criticism. While some may not like what we have to say or how we say it, we have the free speech right to do so - just as other political and social commentators have been doing for years." The film's star Ben Stein was perhaps a bit more caustic in his response, "So Yoko Ono is suing over the brief Constitutionally protected use of a song that wants us to 'Imagine no possessions'? Maybe instead of wasting everyone's time trying to silence a documentary she should give the song to the world for free? After all, ' imagine all the people sharing all the world...You may say I'm a dreamer But I'm not the only one I hope someday you'll join us And the World can live as one.' "  On June 2, 2008, U.S. District Judge Sidney Stein (no relation to Ben Stein) ruled in favor of the filmmakers under the "fair use" provision. Atheist professor PZ Myers attempted to attend a pre-release screening of the film, but was prevented from entering by security officials. However, Richard Dawkins, who had accompanied Myers, was able to get in by using his rarely used real first name, "Clinton." Myers claimed that the production team had full knowledge of his attendance through the online RSVP system and Dawkins claimed that it was an "incredible piece of inept public relations" to "expel" PZ Myers from a film about people being expelled for their views. Evolutionist Richard Dawkins claimed he was tricked into appearing, indicating that he had been told it would be a movie named Crossroads that would be focused on "exploring the controversy." (Two others who similarly claimed to have been deceived said they would have appeared anyway.) In response, Ben Stein said that no one he interviewed asked what the film would be about, and the co-producer Walt Ruloff said at the preview that interviewees were paid and were even told ahead of time what the questions would be. WingClips provides several free glimpses into "Expelled". Expelled - Genetic Mutation (2:23) - Scientists discuss how the evolutionary theory of random genetic change contradicts what really occurs in nature. N.C.S.E. Exposed: No Victim-Blaming Allowed! Reviews of 'Expelled' on Rotten Tomatoes. ↑ Stein told O'Reilly, "This whole problem is about violation of the First Amendment. There are many scientists - many - who have been expelled from their jobs, who have had their web sites shut down, who have been denied grants [or] tenure because they wanted to question the limits and boundaries of Darwinism ... that's not how society has progressed." ↑ Expelled - Implications of Neo-Darwinism (4:15) - Doctors and Scientists explore how the belief in Neo-Darwinism affects our society. ↑ Lesley Burbridge-Bates (2007-08-22). Expelled Press Release. Premise Media. Retrieved on 2007-09-29. ↑ Meyer is alluding to a statement by Harvard paleontologist George Gaylord Simpson. ↑ Weikart, Richard, Was It Shameful for “Expelled” to Connect Darwinism and Nazi Atrocities? 3rd May, 2008. ↑ Wieland, Carl, Cracking the wall in science 20th February, 2008, (Creation Ministries International). ↑ Expelled, on Box Office Mojo. ↑ Bethell, Tom, No Intelligence Allowed The American Spectator, 19th February, 2008. This page has been accessed 90,585 times.